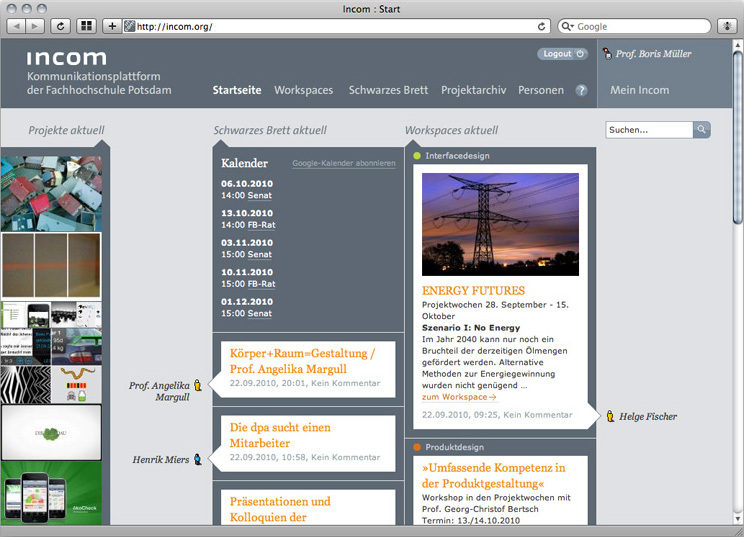 Incom.org is the online communication plattform of the Design Department at the University of Applied Sciences Potsdam (FHP). By making information accessible and enhancing communication, Incom supports the project- and teaching activities in the department. Furthermore, Incom is an open plattform. So it is an online resource for all topics relevant for design. Incom was specifically designed for the needs and requirements of a design department. The teaching- and project activities in our department are all based on small teams. So it was important to develop a community model that takes this structure into account. By providing students and staff with so called »Workspaces«, Incom aims at re-creating the same conditions that exist in the real space. Workspaces are similar to community blogs. They provide the users of the Workspace with a chronological list of postings and uploads as well as an overview of all active members. Workspaces are usually public, so they provide visitors with an insight into current activities.